BrainFizz - Routing, Making, Custom projects & Training. : Under pressure: "New" kid on the block, putting the pressure on your first choice of clamp brand. To that end I was contacted, (twice in one month - unheard off!! ), this time by PiherUK based in Coventry. With a background in welding and metal work, they are planning to launch a new range of woodworking clamps, already available in Europe, to the UK market and asked me for my woodworking perspective. I went to visit them in person as it's less than an hour, also it was a sneaky way to size up the people I could be potentially working with on this project. I've never been one to fall open mouthed at the "marketing hype" of any salesperson, but having been handed one of their clamps I was straight away struck by it's build quality. A Hob-Nob amongst a sea of rich tea quality for you biscuit dunking tea drinkers, if you will. I half expected a marketing demonstration, and sure enough, out came a clamp from a brand I already owned, reading some 700+Kg on a pressure test rig. Impressive enough even with the usual "4 white knuckles" we've all used to close up those small gaps in our joints. I was unsurprised as the read out slowly started to drop and the bar slowly gave under the strain - something I experience myself with these clamps. Next came the clamp I was holding, A Maxi-press F -model which is rated to some 9000N(900Kg). As the digital readout churned out ever increasing numbers all the way up to 8300ish it stopped, and stayed, no movement and no quarter given. It was then I realised the ease at which the clamp had done up. You can actually rotate the handle 90 degrees, but this was still straight and without white knuckles, or ruffled brow. This was actually getting interesting. 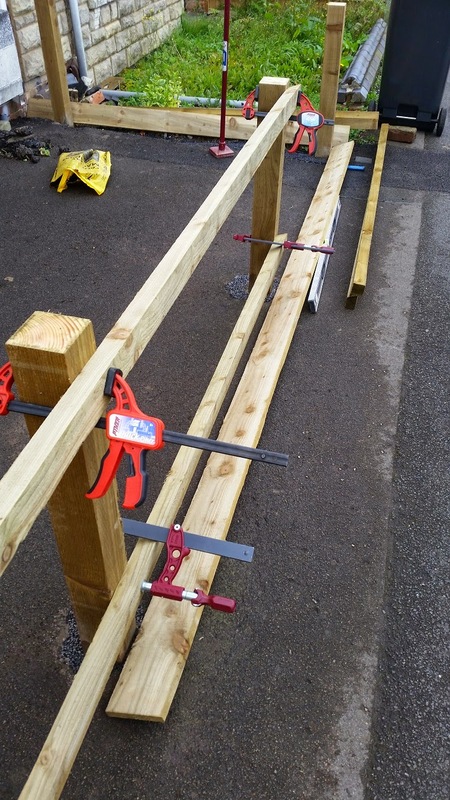 After nearly 2 hours slipped past, under haze of mugs of tea and conversations about clamping, I was asked if any of their range had an application in the woodworking workshop, and which clamps I thought would be most suitable. The obvious temptation is to fill your pockets and run for the hills, but keeping my cool I picked out some models, in pairs that would have an application in projects I had on the bench and in the pipeline. Also space was a consideration, both immediate and long term. What if these actually didn't turn out to be a long-term item with a place in my workshop, I'd have to store them until I could send them back too! As the discussion drew to a close and we loaded my haul, my thoughts had already turned to various "experiments" as to their sturdiness, value, long term potential and whether they were fit for purpose. Nearly the last thing I said to the team was "These look very sturdy, but I will be trying to break them", They laughed it off, with the expected "well you can try". I don't think they really realised that I would actually be trying to break them. In use on a wet morning. A big help! I certainly didn't realise just how well justified their optimism actually was! It was going to be a rather interesting week for me, Stay tuned to find out what I did and how I fared, not just from the Maxipress, but also the other models too, Including a UK woodworking exclusive, not even the magazines have got their hands on yet. Make sure you sign up, so you don't miss just what I've been doing with these clamps, and find out how they stood up. If you cant wait a short while, download the full catalogue at Piher.com and take a look. I was surprised to find the woodworking clamps listed as "light duty", until i saw the heavy duty range! 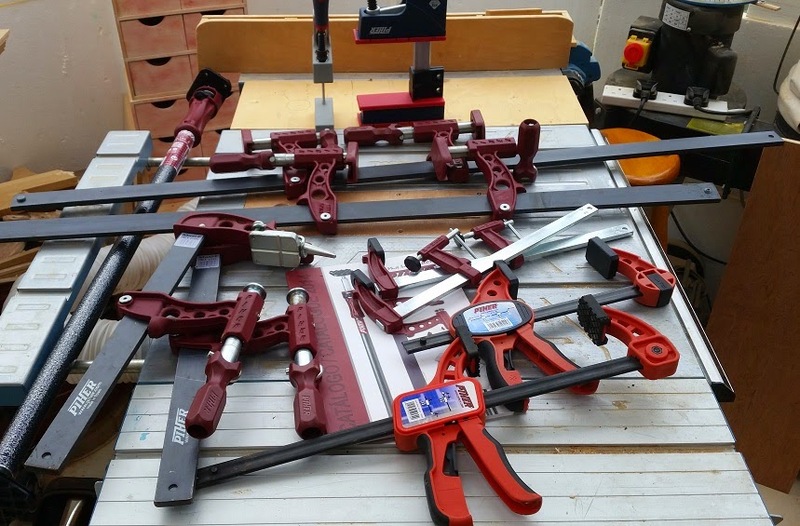 I'm not a marketeer, nor am I a salesman - in fact I don't like telling people to go and spend money, but if your in the market for clamps and you're in the UK or Europe, these could be the only place to get your clamps in future.